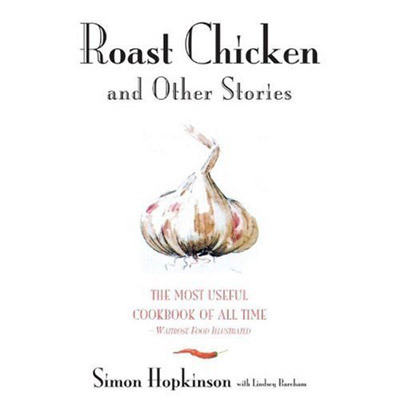 In summer, nobody likes to be hovering over a hot stove. One easy solution? Cook your Sunday ham outside on the grill. 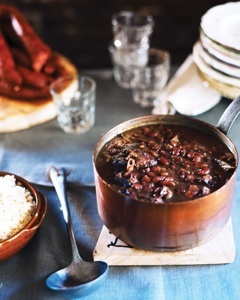 It’s delicious and very simple if you repeat this mantra: Low and Slow. 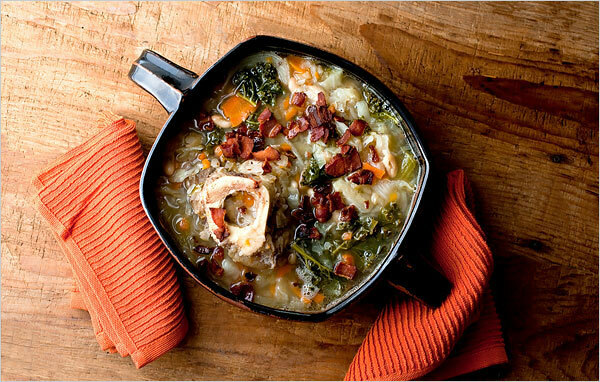 Because of its thickness, ham takes a fair amount of time to cook (or warm) through. 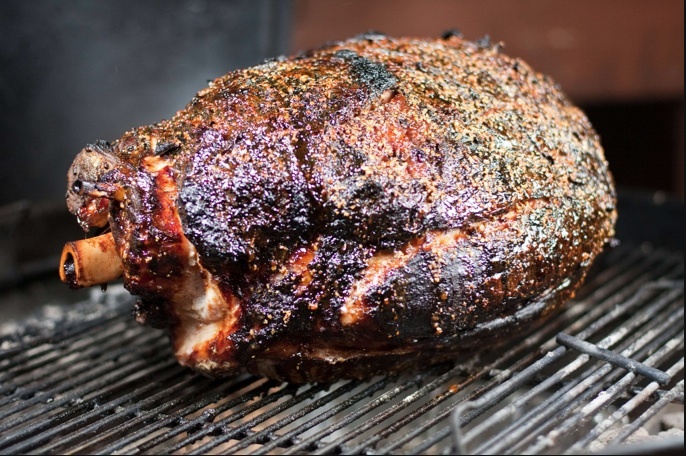 Using a gas grill on low heat or a charcoal grill with indirect coals, you can bake your ham by wrapping one end with aluminum foil and using a glaze to help keep it moist. First, soak wood chips in a bowl of water, 30 minutes minimum, or as long as overnight. Popular choices are apple wood, hickory and adler wood. If you have a charcoal kettle grill, get a couple of cheap metal pans (the disposable kind from the grocery work well) and fill them halfway with water. Place them at the bottom of the grill. Get the coals hot using a chimney starter. When they’re white, add them around the grill pans off to one side. Add the soaked wood chips on top of the charcoal on one side of the grill — you want there to be a place to put the meat away from direct heat. If you have a gas grill, make a pouch in aluminum foil of the soaked wood chips. Poke some holes in it and put it down by the burners. Turn on the grill and when the pouch begins to smoke, you’re ready to grill — remember, low and slow. 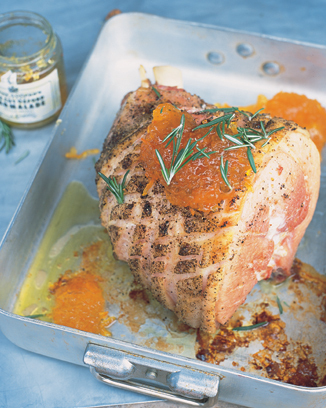 Cooking time will vary based on the size of your ham, but estimate 20-25 minutes per pound and check often. 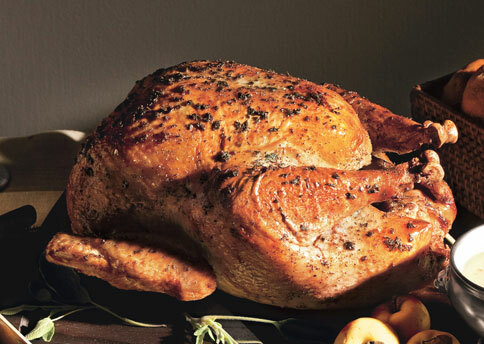 You’re done when a thermometer reads 140°F (not touching bone). Let the meat rest for about 10 minutes before carving. And don’t stop there! There are dozens of ways to use a backyard smoker, from smoking your own salmon to Spanish-style smoked vegetables (eggplant, squash, peppers and carrots) with a garlic vinaigrette. Holiday Ham leftovers at their finest. To me, sandwiches are like cars. They can be humble and serviceable like my old green Saturn, they can be overly large and hard to handle like a Hummer, efficient but somewhat boring like a Prius, or packed with things you don’t really need like a Mercedes tricked out with docking stations, heated seats, and snowboard racks. 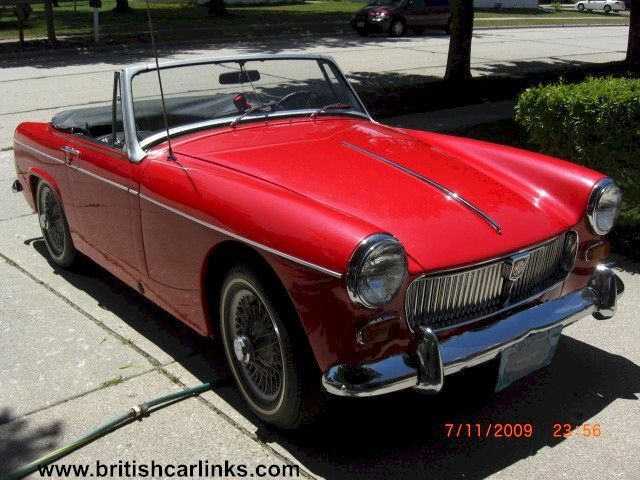 Following this analogy, the world’s greatest ham sandwich is a red 1969 MG convertible. It’s sporty. It’s sleek. A classic with a European flair, it turns heads and it’s gone in a flash. It’s easy to make, fun to eat, and good enough to be pictured on calendars. *Start with the bread. A fresh crusty baguette is best. A lightly toasted croissant or sturdy rye would also work, if you can’t find the perfect combination of crunchy brittle exterior and pillowy soft interior that defines the ideal French bread. *The add cheese. Specifically Brie, softened a bit. 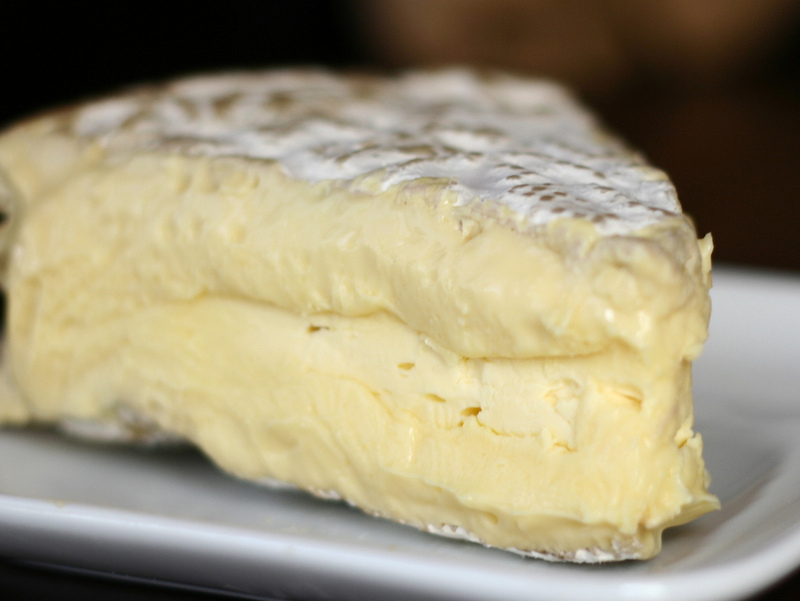 Don’t mess around with fake brie (in a plastic container, without the rind), or American brie that’s been pasteurized and sterilized until it tastes like Velveeta. Get the real thing – gooey and creamy with a healthy layer of crust. Slice it and cover one half of your halved baguette with the oozing goodness. *Smoked ham, very thinly sliced. 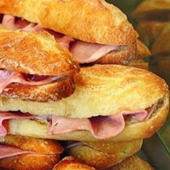 The better the ham, the better the sandwich. 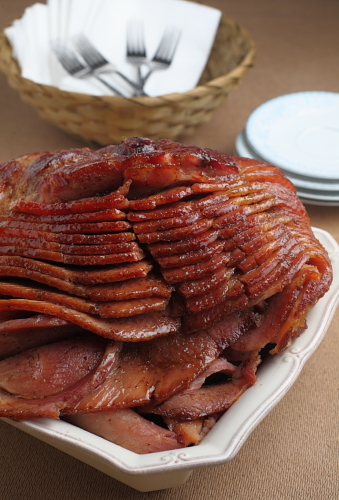 Holiday ham leftovers are perfect! *Baby spinach. Wash carefully, pat dry, and remove the stems. 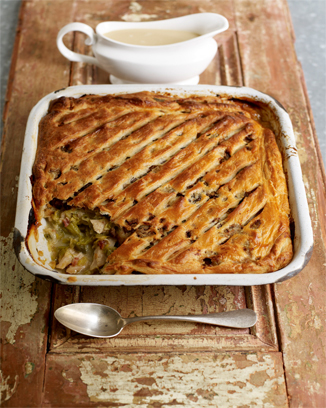 Then pile on a layer of soft, supple leaves – just enough to add a slight crunch and a bitter note to the sandwich. *Cherry mustard. 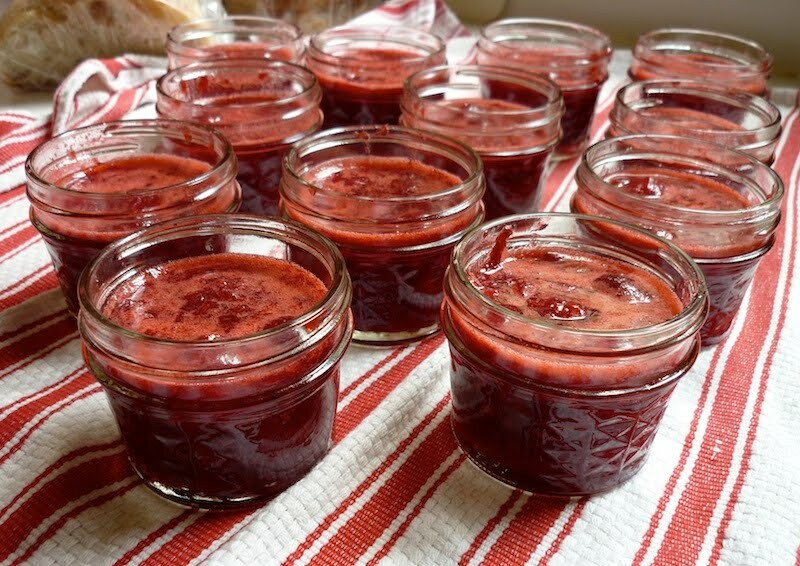 Mix one part cherry preserves (homemade or from the store), with one part dijon mustard. Blend well, then slather the other slice of baguette with that sweet and spicy mixture. Assemble sandwich and luxuriate in the combination of flavors. Think of it as a joy ride along the Pacific highway the top down on a warm summer afternoon.